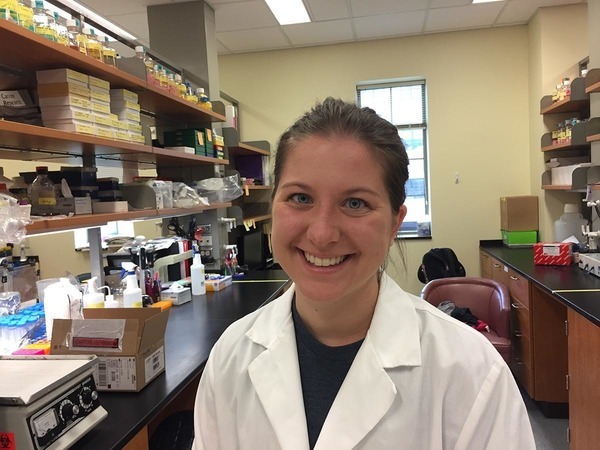 Senior biochemistry major Annemarie Leonard knew she wanted to become a doctor, but the undergraduate research she has done since the summer after her freshman year has further fueled her passion. It also led to her being named as a co-author on a paper about ovarian cancer and the primary author of chapter in an upcoming book. Shortly after arriving at Notre Dame, Leonard began emailing professors about possible research opportunities, and was hired to work at Harper Cancer Research Institute (HCRI) in the lab of M. Sharon Stack, the Anne F. Dunne and Elizabeth Riley Director of HCRI. Leonard assisted with research to further understand how ovarian cancer spreads, or metastasizes. Leonard is a co-author on a September 2017 paper published in the journal Cancer Letters (along with Ryan Phan, ’18, Stack, Professor Matthew Ravosa, recent doctoral recipient Elizabeth Loughran, ’12, ’17 Ph.D, and others). Leonard’s first duties in the laboratory were handling data entry. Soon she had integral roles in other aspects of the data collection process, such as assisting in large tumor studies as a dissector. As she continued honing her research skills, she was given responsibility to help plan experiments. The Cancer Letters article demonstrated that mice bearing more litters were less susceptible to ovarian cancer metastasis than other same-age mice that had fewer litters. The pathways of certain genes, called interferon-stimulated genes, were “upregulated” in the healthy tissue of mice that had more litters. This discovery could lead to future studies on new therapies based on expression of these upregulated genes. “What I really like about doing research is that it makes what I do in the classroom very tangible,” Leonard said. “As a freshman, I was given questions to help answer; now that I’m a senior, they’ve given me responsibility to decide some of the questions that I’d like to have answered.” In addition to those responsibilities, her work in the Stack lab also led to her authoring a chapter in the upcoming “Methods in Cell Biology” book, which will be published soon. Leonard said she became interested in medicine as a child. By 18 months old, her bones had grown faster than her tendons, causing her to walk on her toes because the tendons couldn’t stretch to accommodate the bone growth. She wore a series of casts until the tendons caught up. Her experiences as a patient sparked her interest in medicine and research, and by age 18 she earned her license as an Emergency Medical Technician (EMT). Leonard, who is working on medical school applications, said she feels her early experience with research will add to her skills when she becomes a doctor. Though she doesn’t plan to pursue a doctoral degree simultaneously with her medical degree, she expects to continue with some level of research throughout her career. Originally published by Deanna Csomo McCool at science.nd.edu on November 30, 2017.